Knowing how to clean your stoneware is important because it helps keeps your stoneware in the best condition for years of fresh, inspiring meals. Cleaning Pampered Chef stoneware is even easier than using it. All you need is a little hot water and a pan scraper—no dish soap required! Food particles, juices, and soap won’t soak into the stones since they’re virtually nonporous. Wait until your stone is completely cooled, then use the scraper to remove any leftover food. 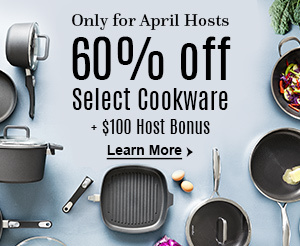 While unglazed and partially glazed stoneware pieces shouldn’t go in the dishwasher, Pampered Chef does offer entertaining stoneware that is fully glazed, making it safe to use in the dishwasher. You can also hand wash fully glazed stoneware with a kitchen brush to scrub off food residue and even use a cleaning eraser if needed. Sometimes, cleaning stoneware needs a little more than a wipe down. If you have lots of food buildup on your stone, Pampered Chef’s Food and Trend Innovator Tim Hagedorn recommends occasionally giving your stoneware a deeper clean. Here are his recommended steps to deep clean your stoneware. Allow the stoneware to cool to room temperature. Soak stoneware in clear, hot water to loosen any baked-on foods. Scrape off excess food using a nylon scraper or a kitchen brush. Prepare a baking soda paste by mixing ½ cup baking soda with 3 tablespoons of water. Spread the paste on the stoneware and let it stand for 10–15 minutes. Scrape off the remaining paste and rinse the stoneware in warm water and dry before storing. A deep clean is also needed if you notice black flakes of seasoning coming off your stoneware. Flaking can happen with years of daily use. It can also happen if you store stoneware in an oven and expose it to preheating and baking cycles when it’s not in use. 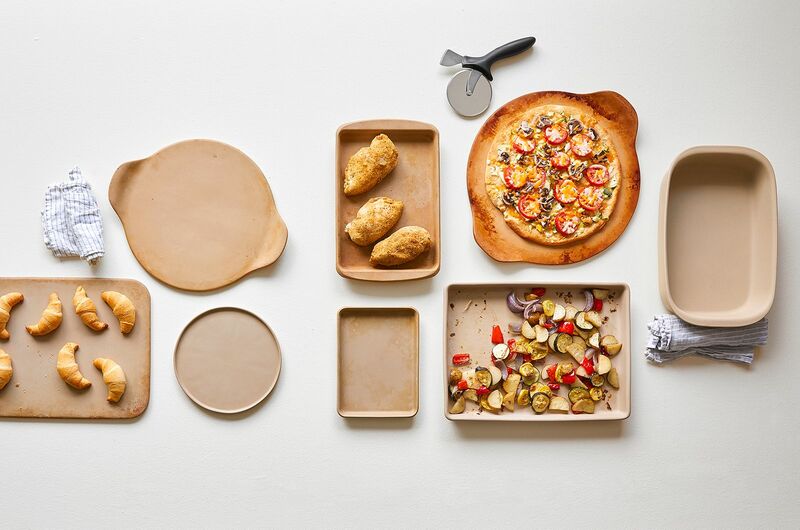 Oven storage dries up and burns off the layers of seasoning, so store your stoneware in a cool, dry place. For more practical tips to care for your stoneware, check out this helpful video. 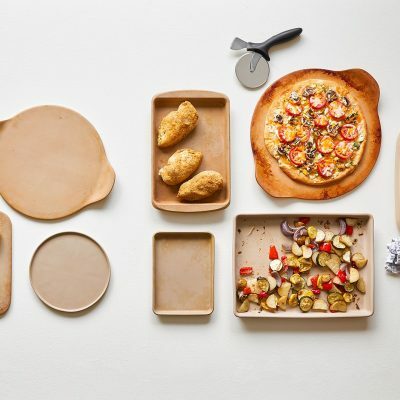 Learn more about how to use stoneware as a natural, everyday way to cook everything from quick dinners in the microwave to light, crispy desserts. Hello- just a comment or question regarding my pizza stone. It was purchased some time ago but only used 3 times. Each time used, the bottom of the crust is not crisp or browned. The top is golden brown with cheese & fixings. Oven temp set on 375 degrees. I used pillsbury hot roll mix and have for years with my large aluminum pan and achieved the desired bottom crust being cooked. Can you offer any suggestions so I can achieve desired results? Kathie Barajas, Pampered Chef recommends not to use Pam cooking spray on any cookware/bakeware pieces. There are additives in aerosol sprays that will cause a buildup over time and create a sticky residue. Instead, brush with olive oil or your preferred cooking oil. Have you tried precooking your crust for a few minutes prior to adding your sauce, cheese, and toppings? I like to throw mine in the preheated oven for 3-5 minutes prior to adding all the toppings to crisp up the crust slightly. Hopefully that helps! Carol, I get this question a lot! I think it’s best to cook pizza at 425-450 degrees. Don’t preheat stone as it might crack. That way both crust and bottom are crispy. Hope this helps! Let me know if you have any questions! For a really really crispy crust just flip it over before admiring the toppings. Suzanne, per the use and care guidelines that come with every piece of Stoneware, Pampered Chef Stoneware is oven safe up to 450 degrees F. I wouldn’t recommend trying to use it at higher temperatures so you don’t void the 3 year guarantee. Carol, I always preheat my stone for pizza at 400, and have done this with the same stone for 18 years now and never had a problem with my stone or the pizza crust. Do you pre-heat your stone? I find that works best for me. Hi Lisa Pampered Chef does not recommend preheating the stone with no food on it. I put my pizza stone in the oven when pre-heating. Then put my pizza on the hot stone when the oven reaches the desired temp. I thought pampered chef says do not preheat the stones? I would recommend putting on a lower rack in your oven. I pre bake my crust for about 5 minutes before putting on the toppings. You can also try preheating the stone. I use a spritz of oil. You don’t have to put it on the stone directly, you can spritz the bottom of your pizza dough before adding the toppings and baking. It helps to season the stone and makes the crust crispy. That’s what I found to work for me. I’ve had my stone for close to 10 years, if not more. Preheating your pizza stone is critical for a crispy crust. This means more than just allowing the oven to come to temp. I’d let the oven come to 475, let the stone get good and hot, then lower it when you place the pizza on it. This should give you the results you want. I put my pizza stoneware in the oven while preheating and put the pizza in on top of hot stoneware. When we make homemade pizza and want a crispy crust, we smear softened butter on the stone before rolling out the dough. It gives us a nice crispy crust every time! Occasionally we also do a light dusting of corn meal to give a different texture to the crust. Hope that helps! Enjoy! Sounds like your oven is not hot enough! I usually cook pizzas in the high 400s and make sure you preheat your stone! Dust your stone with (organic) cornmeal beneath your crust. Pampered Chef used to include this tip. I just had my bar pan break in half when I took out of oven. It was well seasoned. Probably 20 years old. I had 2 small pieces of salmon on it that broiled for about 8 minutes. Salmon was thawed at room temp and so was pan. Ideas? Laura The problem is you broiled the fish. Only the Rock Crok family can go under the broiler not the other stones. So sorry to hear about your stone.Our stones are not supposed to be used under the broiler. That would be my guess of why it broke. Also, a small amount of food on a large stone can cause that so depending on the size of the stone relative to the size of the food that could have contributed to it too. But more likely the broiler is the issue. Pampered Chef Stoneware is oven-safe to 450°F. It is not safe to use under the broiler. Also, 2/3rds of the surface area must be covered each time or it can get overheated and break. Mine did this also. Could not figure out why, then saw I had oven on broil and not bake. No one to blame but me, in too much of a hurry and destroyed my favorite stone. It should not be pre-heated either. The use and care instructions are pretty specific. I forgot my cookie sheet stone in the oven when I turned my broiler on. It didn’t break but turned black and smells burnt. I tried cleaning it with baking soda paste but it didn’t work. Any suggestions? I agree with Cheryl I use cornmeal on my pizza stone. Then prenake my crust for 8 minutes before I put on the toppings. I have a crisp crust and easy cleanup. I make lots of pizza on my stones. Set oven at 400. At publix or Walmart you ca purchase pizza doug. I roll it out with the Pampered Chef rolling pin on our pastry mat dusted lightly with flour. I only used oil on the pan to season it the first few uses. Due to seasoning of the pan I no longer need any oil. I do not pre cook the crust. I put the crust on the pan, add sauce cheese and whatever topping gs you like. Put one rack just below the middle of the oven and one juts above the middle. Cook for 10 min on bottom rack (at 10 min lift the edge of pizza crust and check to see if bottomed brown. You are looking for a very light browning. If browned moved to top rack) Finish cooking the additional 10 min to cook too. Keep checking the bottom of the pizza every few minutes.) I remove mine when it is a light brown and leave it on the pan 3 minutes then while I cut it and serve. Once everyone has theres I remove remaining pizza and put on. cooling rack. IMPORTANT- once you get the crust to the color you like, cut and remove from stone. It will keep cooking and make it hard and crispy, but not burnt. Each oven is different and I encourage you see what times work best for you. one is a round pie pan with 1 inch side, non glazed and the other is a 9×13 rectangle baking dish non glazed Ideas? I use my stoneware for everything. My favorite things to make in the 9×13 are meatloafs (I make a bunch at a time to be able to freeze leftovers for lunches), roasted chicken and veggies, cakes, and other treats. I’ve made family style pot pies in it as well. I would recommend using it for your recipes which call for a 9×13 dish, like lasagna. Since I don’t make pies, I’ve never had the pie pan, but you could use that one for smaller servings of foods as well. I hope this helps. I started using some stoneware I picked up at a garage sale and it was brand new. It seems to have a sticky coating of oil on it from cooking and I’m not quite sure how to get off. I tried scrubbing with hot water. Maybe the hot water soak and baking soda? Or did I do something wrong for this sticky oily film to develop? I have never been able to get my stones clean, as in back to the tan color. I was told to put them in an oven at around 400 deg or more and then remove and let cool. Wipe while still a little warm. This never worked, just got darker. I have the burgundy roaster with lid and there is black on the outside due to butter or milk that spilled while I was checking the food in the oven and too hot to clean. I tried cleaning while it was still warm. I tried soaking in hot water, using a sturdy sponge. Please help. The blackness/brown isnt very appealing. Thanks.